Television is in a golden age of comic adaptations nowadays, and DC is building a small screen empire on multiple networks. News that Barry Allen of The CW's The Flash would be crossing over to CBS' Supergirl marked the first time that networks would be sharing heroes, and fans have been itching for details. One of the biggest questions has been of whether or not Barry and Kara live on the same Earth. Now, CBS has the answer: The Flash and Supergirl are definitely set on alternate worlds. According to a release from CBS, the “Worlds Finest” episode of Supergirl will see the Flash suddenly appearing from an alternate universe and agreeing to help Kara battle a few bad girls in exchange for help finding him a way to get home. Considering how Kara is usually so willing to assist those in need, her seemingly mercenary attitude toward helping Barry return to his Earth is a pretty big sign that she’ll be in dire straits fighting against the combined villainy of Silver Banshee and Livewire. Of course, Barry is generally pretty helpful as well, so the two most upbeat small screen DC heroes should be a formidable and fun pair of crime-fighters. Barry and Kara coming from alternate Earths is almost certainly the best way to handle the logistics of the crossover. As exciting as the team-up of the Flash and Supergirl will undoubtedly be, the precedent of the CBS’ Supergirl-verse and The CW’s Flarrow-verse existing in the same universe could complicate matters for all shows involved. If Kara has a speedster on her speed dial, that could lower the stakes whenever she needs another ally with powers, and if Kara existed in Barry’s universe, that means Kara would exist in the rest of the CW's superhero series as well. As much as Stephen Amell might want an Arrow/Supergirl crossover, the Emerald Archer is already unfortunately overshadowed by the metahumans during crossovers with The Flash. 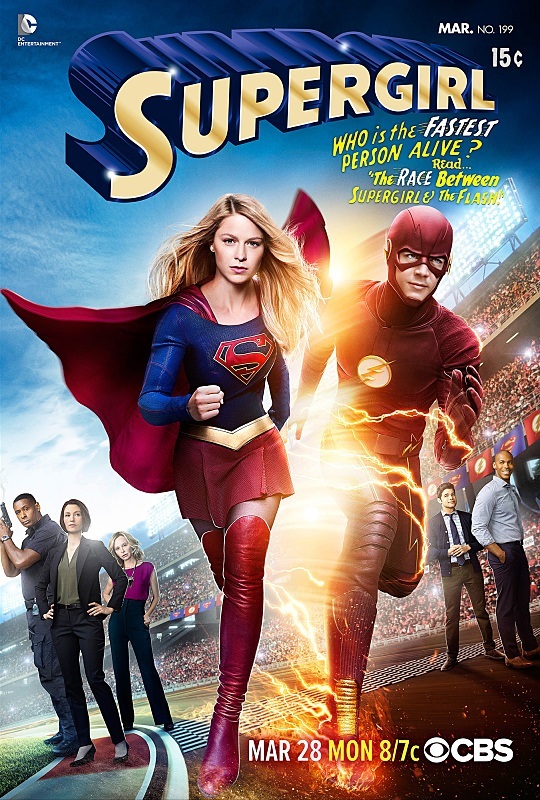 Considering Barry and Oliver need to remain the heroes of their own shows, the Flarrow-verse is definitely better off only occasionally connected with Supergirl. The fact that The Flash and Supergirl exist on alternate Earths isn’t a huge surprise, given that the first tease of the crossover came on The Flash when Barry was racing between Earth 1 and Earth 2. Plus, the episode title. And this confirmation that the crossover is really a major special event for both shows just makes the wait for the upcoming episode feel even longer. In the meantime, check out the nifty episode art the show just released. Luckily, we’re down to a matter of mere weeks before “Worlds Finest” hits the airwaves on CBS on March 28. The Flash will be returning after a brief hiatus on Tuesday, March 22, so we may be able to look forward to seeing just how Barry ends up in Kara’s National City. In the meantime, be sure to tune into Supergirl on Mondays at 8 p.m. ET to see what adventures Kara and Co. get up to before the big crossover.